Google’s android operating system is gaining serious momentum. it may lack the definitive experience of apple’s iPhone oS but its supporters argue that the flexibility and customisability that make such a definitive experience impossible on android are its strengths. operators and vendors, they say, can pick and choose from the various parts of android and make it into whatever they want. Android has most definitely arrived. The Google-backed operating system first appeared commercially on the HTC Dream (marketed by T-Mobile as the G1) in October 2008. At this year’s Mobile World Congress in Barcelona, Google CEO Eric Schmidt told the audience during his keynote presentation that there are now 26 Android devices with 59 operators in 48 countries. There are 65 partner companies in the Open Handset Alliance, the organisation that stewards the Android community. 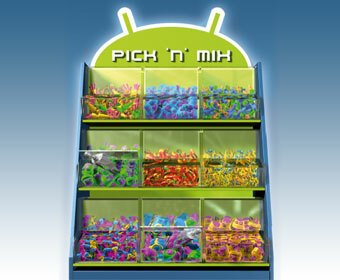 Schmidt added that 60,000 Android devices are being shipped each day, a figure that had doubled on the previous quarter. Figures from Informa Telecoms & Media forecast that, this year, the top five smartphone operating systems, Symbian, Apple, Research in Motion’s Blackberry, Microsoft and Android will ship on more than 250 million devices. Of this number, Android will account for 8.3 per cent, with 20.78 million devices. this puts it in fifth and final position, with the nearest competitor, Apple, on 28.56 million. But by the end of 2011, Informa expects Android to have overtaken both Apple and Blackberry, with device shipments of 35.84 million and a 10.6 per cent share of the market accounted for by the top five operating systems. 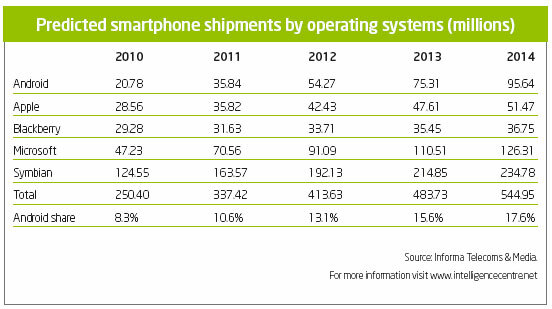 While the firm does not expect Android to improve upon its third place in this segment by 2014, which is as far as Informa forecasts the market, it does anticipate that Android will continue to gain ground, shifting 95.64 million units and commanding a 17.6 per cent share of the top five smartphone operating systems’ overall market. It’s entirely natural that Android should overtake Apple and Blackberry, given that these two operating systems are single-vendor environments while Android is attracting increasing numbers of players. Among the leading handset vendors, Samsung, LG, Sony Ericsson and Motorola are all committed participants in the Android space, with Motorola in particular owing a turnaround in its fortunes to a successful implementation of the operating system in the high end of its portfolio. But Android’s growing popularity with lower tier vendors looking to establish themselves in the smartphone market will be a significant driver of Android uptake as well. Acer and Huawei announced four Android handsets each at Mobile World Congress, while Alcatel and Garmin-Asus both unveiled their debut handsets based on the platform. As the cost of producing smartphones dwindles, the top tier vendors are losing their exclusivity—and Android is proving central to bringing these costs down. Glory Cheung, a spokesperson from Huawei’s devices unit concurs, suggesting that the operating system will actually come to “dominate” the handset market as a whole. “We’re confident that Android will dominate the mobile phone market, since handset manufacturers can greatly reduce R&D costs through the free Android platform,” she says. “Operators are showing signs of favouring this platform, largely due to the currently prevailing financial pressures. Huawei’s operator customers perceive the main attraction of Android (compared to other platforms) to be that it is license free and open source,” she says. Not all organisations involved in the Android space feel quite so bullish about its prospects, though. “We are investing so heavily in Android that I would love to agree with such a blanket statement [as Cheung’s assertion that Android will dominate] but I don’t think I can,” says Sy Choudhury, product manager at Qualcomm’s silicon unit, Qualcomm CDMA Technologies. Qualcomm’s Snapdragon chipset is gaining real traction in the Android space, and the firm’s technology was in the first Android handset to launch. “Android will be one of the top smartphone operating systems but there are enough economic reasons why other application platforms and operating systems will continue to thrive. We definitely see that the current number of smartphone operating systems will coalesce over the years, but we don’t expect that to happen in the next two years, or for the number to come down as low as one or two,” he says. For Choudhury, one of Android’s key strengths is its versatility. While the success in this space of firms like Apple and Research in Motion is clearly down to the level of control and single mindedness that is possible in a single vendor environment—and while there will never be an “Android experience” because of the diversity of products and the customisable nature of the platform— Choudhury argues that Android allows different players in the value chain to make it their own. This includes the operator community and Android’s popularity with carriers owes a great deal to the opportunities it affords to them to specify their own handsets. “The carriers have an awful lot of say in how to modify and move Android forward,” says Choudhury, citing a number of key examples. The first and most important, he says, is China Mobile’s Ophone platform. The world’s largest carrier announced the Ophone platform in September 2009, with the first handsets hitting the market at the end of last year. China Mobile has reportedly signed up more than 20 vendors to develop handsets based on its customised Android platform and 20 models are expected to launch during 2010. Lenovo, HTC and LG all have Ophone devices that are either available or imminently so. It’s never simple, though, and the trade off in this instance is that the whole programme is run by Google, arguably the company that presents the single biggest threat to maintained operator relevance in the mobile internet space. But Google says it is not seeking to control what other companies do with the operating system. AT&T launched Motorola’s Backflip Android handset with Yahoo as the onboard search engine. Motorola itself announced recently that it intends to use the Bing search engine for all of its Chinese Android handsets that are not part of the Ophone project, which is probably just as well given Google’s current difficulties with the Chinese state. Google’s strategy with Android remains the source of much debate, especially since the launch of its Nexus One handset earlier this year. Google’s control over the development of the hardware as well as the software extended to the firm specifying the position of the home key on the handset and represented a much anticipated move into a new space, although the phone was manufactured by Android pioneer HTC. The suggestion has been made more than once that Android represents Google by stealth and the firm has been at pains to stress that this is not the case, mindful, no doubt, of Nokia’s struggles to position Symbian as a fully independent platform. (At MWC, Schmidt pledged not to favour Android in the development of its services, promising to treat all operating systems with parity.) So the arrival of the Nexus One was interpreted by some as the result of Google’s frustration with existing Android products, and the extent to which they were showcasing the firm’s capabilities to develop compelling mobile web services. Prior to the Nexus One, says Informa analyst Jamie Moss, “Android phones were not getting the rave reviews that Google was hoping for, especially as the end user experience was being endlessly compared with the iPhone. So despite all the enthusiasm about Android, I think Google were concerned that the operating system’s reputation would become damaged before it had a chance to really get going.” Moss suggests that Google’s handset play sees it looking to take a leaf out of the books of the likes of RIM and Apple and their tightly controlled strategy. “If the iPhone and the Blackberry can teach the handset market anything, it’s that tightness of integration between hardware, operating system and user interface is key to delivering the best possible end user experience,” he says. “The ‘problem’ with Android phones arguably lay in the integration of the OS with the hardware. This was being done by the OEM, meaning that the OS developer was losing control of the user experience that they were designing. “I think Google wanted to prove how good an experience Android could provide and set about achieving this by integrating the OS themselves and getting an OEM to make a device for them. As a software developer they are probably in the best position to do the integration—and are likely to be able to get the best possible performance out of the OS,” he says. IDC’s research director John Delaney described the Nexus One as “the best Android phone to hit the market so far,” when it launched in January, so if Moss is right about Google’s motivation then perhaps it succeeded. But the price of the unit, and the choice of sales channel, were set in a way that didn’t seem designed to encourage uptake in huge volumes. It was thought that perhaps Google would try and undercut Apple with its pricing, but it did not. Delaney believes that Google sees these devices as a means to an end. And that end is to build a large user base for Google’s mobile services; to expose that user base to advertising; and to collect the data its user base generates. “In other words, Google wants to be everyone’s starting point when they use the mobile internet,” Delaney said. “What’s happened is what happens with every open source project,” says Qualcomm’s Sy Choudhury. “Google has realised that there are constituencies who will take Android in different directions and that, if they are to have more of a guiding hand in what the Google experience defines, they’re going to have to step up to the plate a little bit more. I think Google has realised that Android can be both the open platform and the showcase but that they don’t get everything for free just by throwing it out there and having the best web services,” he says. No mobile operating system can be judged fully independently of its applications, of course and the Android Market application store currently has more than 30,000 applications on its shelves. In its approach to its application store, Google has made another concession to carriers, as Informa’s Jamie Moss explains: “It’s interesting to note that it may be the relatively small monetary value that application stores have that has enabled Google to take its approach with the Android Market—taking a zero cut of the revenue and instead giving a 30 per cent cut to the mobile operators in payment for billing,” he says. “This dramatically increases the flexibility of the store, by not requiring the user to sign up to any other billing mechanism (unlike with Apple’s App Store) and not directly competing with the carriers. In this way the mass-market chances of the Android Market are boosted,” he says. And some developers are praising the Android platform accessibility. Sean Guy works for UK developer The iPhone Developers: “While many developers have found Apple’s development environment easy to use, it is of course limited to Mac only,” he says. For all the focus on Android as a smartphone operating system, and Eric Schmidt’s assertion in February that Google’s new philosophy is “mobile first” the plan is for Android’s reach to extend beyond the mobile form factor. This is the fourth prong in the Android offensive, says Qualcomm’s Sy Choudhury, to complement the Google-experience, operator-experience and OEM-experience approaches. And with Apple’s iPad drawing so much attention, the expanded form factor is likely to be a key experimental battleground for operating systems. Huawei, Dell and HP are among the firms producing this next tier of Android devices, which can include smartbooks, netbooks and tablets. There is even an Android ereader scheduled for launch this month. US firm Spring Design manufactures the ‘Alex’, which features a 3.5-inch colour screen suitable for browsing and running Android applications as well as a paper-like 6-inch EPD screen. The device will have wifi, GSM and EV-DO connectivity and, like the Amazon Kindle with which it will compete in the marketplace, will not be tied to a cellular contract. Rather the cost of connectivity will be bundled into the price of the ebooks. We are now in a world where people are starting to choose their mobile phone based on the operating system that it runs and the applications that the operating system enables. The strengths of Android seem to lie in the fact that any player in the market that wants to get involved in its development can do so, and define their products as they see fit without having to foot the sizable bill that comes with the development of an operating system. Google is not motivated to become a leading handset hardware brand but it has laid down a challenge to OEMs and carriers with the launch of its range of terminals. By inviting them to prove that they can do a better job than it can itself, Google has effectively guaranteed that a range of key mobile players will take its Android operating system and contribute to its evolution.